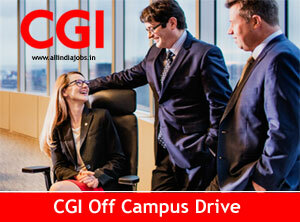 CGI Off Campus 2018 Drive For Freshers is announced by the officials of the CGI company. Here is the best opportunity for candidates who are waiting to start their career with the software industry. In this page, we are giving you the complete details regarding the CGI selection process and also the CGI interview questions that are asked mostly in the interviews. The candidates can make use of this opportunity and have a bright future ahead. It is suggested for all the fresher graduates to make use of CGI off campus drive 2018 as there is a very tough competition for gaining a job. Candidates can also check eligibility criteria, salary etc. in the below sections. CGI is a software and business process outsourcing company. CGI is now interested in hiring graduates those who have completed their graduation in 2017 and also who are in the final year of their graduation for various positions. CGI will be recruiting the candidates with the eLitmus online written test. Candidates can also refer to that eLitmus Exam pattern so that they can clear the exam easily. Students are requested make use of this opportunity and have a great future. To make them burden free in the preparation for their interview we are providing them with the interview questions, CGI placement papers and the syllabus that play the best role in the preparation process for CGI Off Campus 2018 Drive For Freshers. Students who are graduated in the year 2018 and 2017 from the domains of BE / B.Tech / ME / M.Tech, M.Sc in Computer Science / Information Technology MCA with B.Sc / B.Com / BCA / BA (with Math / Statistics / Computers Background) are eligible to this CGI Off Campus 2018 Drive For Freshers. For complete eligibility details like marks, backlogs, skills required, etc., students can check below. People with good interaction and understanding are encouraged. They must be having basic knowledge in the software programming languages. Candidates having any added certification are preferred with the regular ones. The candidates with additional qualifications are asked to bring the certifications as a proof during the time of their interview. The selection process for the interested and the eligible candidates will be in 5 rounds. The candidates who are willing to attend CGI Off Campus 2018 Drive For Freshers can have a look at this for the complete knowledge regarding the selection process. Initially, there will be an online written test (objective type) with around 50 questions from aptitude and reasoning. The candidates qualified in this round will be having the group discussion as their second round of interview. For the people who are qualified in this round, there will be a technical round of interview. Now, there will be another written test that is completely based on the technical questions. The final round of interview is the HR round. The students who are interested to attend the interview process at CGI Off Campus 2018 Drive For Freshers should need to have at least 60 percent in their X and XII standards. Their percentage in the graduation should not be less than 65 percent of the aggregate or 6.5 CGPA (till date). The candidates attending the recruitment drive should not have any backlogs as of the present date. Candidates who have written the exam and are waiting for the exam can attend the drive. But they are needed to make sure that they will have no backlogs remained at the time of the joining. The salary details for a person will generally vary on the basis of the qualification and various other factors. Here we are providing you the salary details that are prescribed for a fresher graduate. For complete details, you can visit the official website. Allowances: 8.5% of the basic salary. The candidates will be required to register with the help of the links provided below to attend the CGI Off Campus 2018 Drive For Freshers. By clicking on link prescribed for registration that is given below you can register yourself to the off campus drive. All that you need to do is to fill up your complete details, check whether you have the minimum required qualifications or not, and then click on the submit button. You need to keep the registration id and the password safe for any further references. The students in a hurry to attend the CGI Off Campus 2018 Drive For Freshers may forget about the things that are needed at the time of interview. Here are those mandatory documents for the sake of students. An updated resume that is self-attested, recent passport sized photographs, previous marks lists, and college id or any government id proofs. The candidates who are serious about this CGI Off Campus 2018 Drive For Freshers interview drive can make use of these HR interview tips and make their interview process a successful one. The students are also advised to make use of the available test patterns that will be helpful for you during the online written exam. We hope the above provided information about CGI Off Campus drive is useful to you. All the best for your career. Keep visiting our website All India Jobs for regular job updates across India. Our website www.allindiajobs.in is a place where you can get details regarding various interviews and the interview procedures along with the other required materials like placement papers, interview questions that play an important role in the interview process.